The San Pedro Transport Department is asking business establishments to cooperate with them in a new regulation that is being implemented. 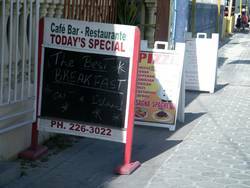 There has arose a problem being caused by the over 120 "Sandwich boards" boards used by various businesses to advertise their services such as daily menu, cart rental rates and even room rates, being placed on the streets. It is a common occurrence on the island, and has become a traffic hazard for drivers and motorists who have complained on numerous occasions to the San Pedro Traffic Department. 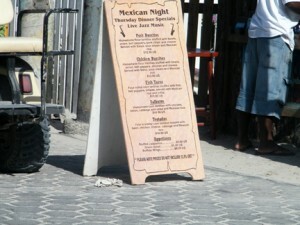 Chris Nuñez of the San Pedro Traffic Department informs The San Pedro Sun that Traffic Wardens have been advised to approach the various businesses individually to seek an amicable solution to the issue, by requesting that the various businesses remove the boards; however that method has not been successful. As a result the Department has decided to issue a Press Release. As of present, a decision has not been made as to what penalties will be imposed on violators of this new regulation. Mr. Nuñez stated, "We are asking them to cooperate so that we can alleviate the traffic issue, by them not putting the boards too much in the street, where they are causing a problem for motorists trying to park." It is the desire of the San Pedro Traffic Department that the various businesses will corporate so that together they can work to alleviate the problem in a manner that would not require penalizing businesses. In other traffic related issues, Mr. Nuñez informed The San Pedro Sun that as of early December 2010, before the Christmas Holidays, the parcel of Caribeña Street between Pescador Drive and Barrier Reef Drive has been closed off to traffic going East. The street is now officially a one way street going west towards the lagoon. Plans are also underway to make the parcel of Tarpon Street between Pescador Drive and Barrier Reef Drive a one way street going Eastward only as well. Both decisions have been long in the making in an effort to avoid traffic accidents and ensure the safety of residents of the island at a time when vehicular traffic in itself is quickly becoming a major issue for the island.